Maestro Ray Fowler addresses the audience during a spring 2017 production featuring The Ohio Valley Symphony. GALLIPOLIS — If music is the food of love, The Ohio Valley Symphony and its members say they will present a full buffet when soprano Risa Renae Harman joins them on Saturday April 28. The 7:30 p.m. concert takes place at the historic Ariel Opera House in Gallipolis under the direction of Maestro Ray Fowler in his final performance. The OVS presents two overtures it considers much loved, one from Mozart’s tale of love and deceit, The Marriage of Figaro as well as what has been called the playful yet gorgeous Overture to Die Fledermauss. Maestro Ray Fowler is in his 28th season as Music Director of The Ohio Valley Symphony. His expertise and energy, so visible during performances, have been key ingredients in the establishment and perpetuation of the OVS in the tri-county region, his colleagues have shared. Fowler graduated from the Juilliard School in New York City. While residing in the metropolitan area, he conducted the much-acclaimed Oratorio Singers and Orchestra, established the Opera Theatre Middlesex County New Jersey productions in and was Music Director of the Kean Chamber Orchestra. In addition to his position at Ohio University, he has been on the conducting staffs of Peabody Conservatory, Shenandoah Conservatory and Columbia University. In 1984-85, he was assistant conductor of the Akron Symphony. In 1987 Maestro Fowler conducted the North American premiere of Entgegen by Anders Nordentoft, aired on Danish television in Copenhagen. In 1989, he was resident conductor at the Sewanee Summer Music Center in Tennessee. Fowler is currently in his fifth season as Artistic Director of the Bay View Music Festival in northern Michigan. As an opera conductor, Fowler toured with Eastern Opera Theatre of New and conducted performances of La Boheme and Don Pasquale with the Erie Philharmonic, Opera Company and conducted performances of the Barber of Bagdad. He also conducted the New York City Premiere of Ned Rorem’s Three Sisters. In 1983 he served as guest conductor for the Knoxville Symphony Orchestra and Knoxville Opera Company’s production of Hansel and Gretel. “We’re all very sad that he’ll be going and retiring but we’re all very grateful for the 30 plus years of amazing music making and helping to create and build this wonderful symphony and getting it to a place where it will be able to go on,” said Ariel Opera House Executive Director Lora Snow of Fowler. Risa Renae Harman offers up a variety of songs spanning several continents and time periods. Dvorak’s “Songs My Mother Taught Me” from his Gypsy Melodies, Grieg’s “I Love You” (lyrics written for the Swedish Nightingale Jenny Lind), the fiery “Girls of Cadiz” full of castanets and Spanish posturing and “The Kiss” from the Italian composer Luigi Arditi. Moving across the ocean for the second half of the concert, “Five Black Songs” are a celebration of Afro-Cubanism and selections from The Sound of Music, Showboat and My Fair Lady fill out the bill. 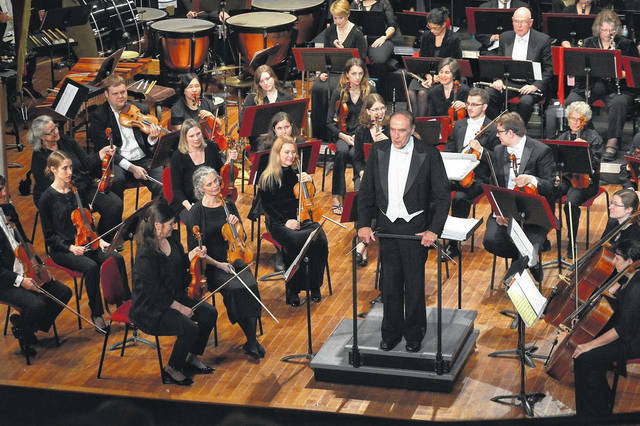 According to its board of directors, the symphony is devoted to bringing music played by skilled artists to the Ohio Valley – and making orchestral music easy to love. The doors are open and the public is welcome to attend OVS rehearsals for free at 7-10 p.m. on Fridays and 1-4 p.m. on Saturdays on concert weekends. Open rehearsals are a way for young and old alike to listen to live symphonic music when schedules and timing do not allow them to attend concerts. They also offer a behind-the-scenes glimpse of what goes into preparing an orchestral performance. Concertgoers, new and veteran, have another chance to learn more about the music with a free pre-concert chat in the third-floor Ariel Chamber Theatre led by Stephen Huang, Director of Orchestras at Ohio University. The pre-concert talks are interactive and informal and begin at 6:45 p.m. Afterwards, stop in at the reception to meet the musicians. All three events are included in the ticket price for The Ohio Valley Symphony concerts at $24 for adults, $22 for seniors and $12 for students. Tickets are available on the website at arieloperahouse.org or ohiovalleysymphony.org or at the box office. Funding for The Ohio Valley Symphony is provided in part by the Ann Carson Dater Endowment. The Ariel-Ann Carson Dater Performing Arts Centre is located at 426 Second Avenue in downtown Gallipolis and is an ADA accessible facility.